Think of a football team that has great morale. The members of the team take pride in their performance, they are driven to do well, and they support and praise each other. They are determined to win and if one player is feeling less motivated, his or her teammates boost them up, encouraging them to be part of the team. In a similar way, that’s how we want our work teams to behave. We want our employees to take pride in their work and to complete their tasks to a high quality level and in a professional manner. But we also want them to act as a team. Such as with the football players, we want them to be a group, each playing their own role but the team is only successful if they work together. Provide the team with opportunities to find new and innovative solutions, as a team. This means encouraging each team member to take an active role and rewarding the team when they come up with different ideas to solve problems. When asking the team to find a solution, give it to the group as a unit, not to an individual, and make it clear that you want them to work together to come up with ideas. Teams work best when they know who does what. A football team is only successful if each individual knows what they need to do, and they are ready to catch the ball from their teammate. So too much the business team act. While, as the manager, you play an essential part in getting the team dynamics right, sometimes you have to step back and let the group form. Once you have made it clear what people’s roles are and the objectives of the team, give the group some time to establish their own dynamics. You cannot force a group to bond, and sometimes it just needs time. All Groups need an identity. This helps the individuals within the team feel that they belong. Such as a football team might represent a city, make it clear what the team is. Sometimes you can get the team to come up with a name, especially when project related, and this can boost the morale of the team. Ensure that the team gets together regularly, perhaps for weekly update meetings or progress reporting. Not only does this give you the opportunity to provide the team with the necessary leadership, it can also give team members the opportunity to discuss issues and provide support to each other. Encourage the team to get together outside of work events. A team lunch can help the members get to know each other outside of a work environment, and if used appropriately, can be an effectively means of improving team motivation. When groups do well, despite who kicked the final goal, reward the team not only individuals. This encourages the group to work together and recognises the importance of everyone’s contribution to success. Rewards can vary, and a variety of approaches, helps to keep the team motivation high. Encourage the team to work together and support each other. 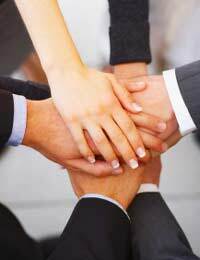 Emphasize the need, not only to achieve good results individually, but as the group as a whole. Rewarding someone for delivering their targets, while the team targets were not met, does not promote unity as one group. Any conflicts on a team are de-motivating and negatively impact performance. Don’t allow conflicts between team members to continue and encourage the group to work together to find resolutions. Depending on your role on the team, it may be necessary for you to participate as a member of the group. If you are absent for extended periods of time, the team may struggle with a lack of direction and leadership.